To manage a large distributed system, one must have visibility into the system. The ability to examine internal state—called introspection—is required to operate, debug, tune, and repair large systems. A typical response to a risky process is to do it as rarely as possible. Thus there is a temptation to do as few releases as possible. The result is “mega-releases” launched only a few times a year. However, by batching up so many changes at once, we actually create more risk. How can we be sure thousands of changes, released simultaneously, will all work on the first try? We can’t. Therefore we become even more recalcitrant toward and fearful of making changes. Soon change becomes nearly impossible and innovation comes to a halt. Correct maps will infinitely impact our personal and interpersonal effectiveness far more than any amount of effort expended on changing our attitudes and behaviors. In the last analysis, what we are communicates far more eloquently than anything we say or do. We all know it. There are people we trust absolutely because we know their character. Whether they’re eloquent or not, whether they have the human relations techniques or not, we trust them, and we work successfully with them. We recently re-watched “Rose” for a movie night and the episode held up fantastically well. The show was radically reimagined from the old series, and yet still worked in a way no other movie or story reboot ever could. Maybe it’s because the idea of reinvention, or regeneration, is built into its foundation, but I think more crucial was that, unlike so many other reboots that have come over the years, this one held onto its core, not as a collection of gimmicks or winks to throw at fandom, but out of a love for what it was and represented. 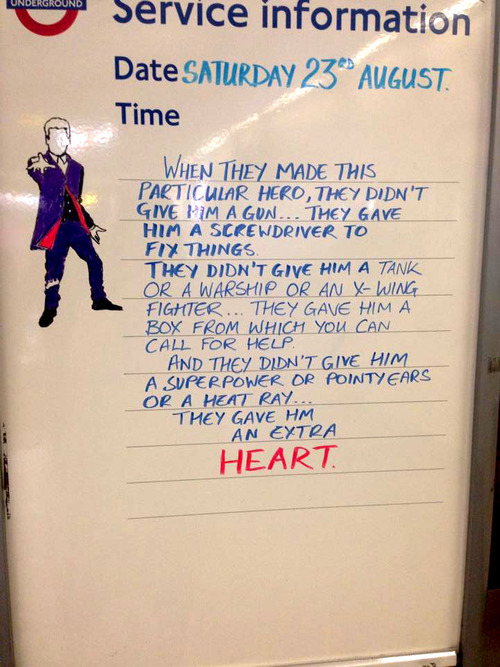 I love Star Trek and Star Wars, but Doctor Who has always had a special place for me. Craig Ferguson called it, “the triumph of intellect and romance over brute force and cynicism”. I can’t think of a better way to explain it really. 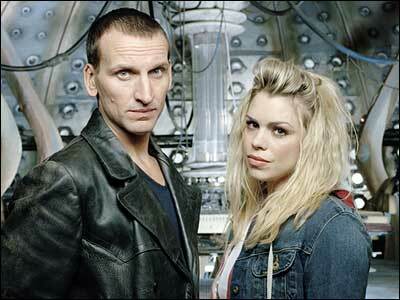 If the Ninth Doctor had not been the man he was, from looks to personality, there stands a very good chance that there would be no Doctor Who to talk about today. 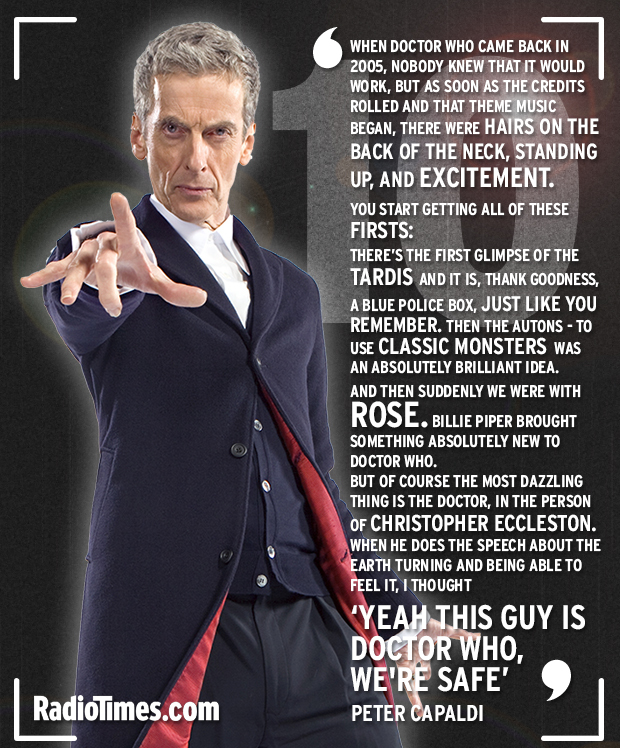 Whatever Doctor Who has become, whatever it might be in the future, that is where it began (again). With Rose Tyler running onto the TARDIS, grinning and giddy, perpetually inviting us on the adventure of our lives. And ten years later, we’re still along for the ride. My friend Maurice Gaston put together a great video, in first person video game style, of shoveling one of the last snow falls of the season on Vimeo. Check it out. SnowDay from maurice gaston on Vimeo. Read Kathleen Vignos, Director of Engineering at Wired.com, on their new design, and launch on a new Web stack. It looks like Wired.com has joined a growing, varied, and impressive list of large media sites using WordPress, including Time.com, Beyonce, Google Ventures, GM, Ted, Nasa, and Forbes. I pulled together that list recently when putting together material for the TechGirlz and Comcast class on Worpress that I participated in. It was nice reading about some of the deployment and development pipeline they are building there. Nice work Wired.com. There have been many great tributes posted about Leonard Nimoy, who passed away Friday, the anniversary of Fred Roger’s death 12 years ago. 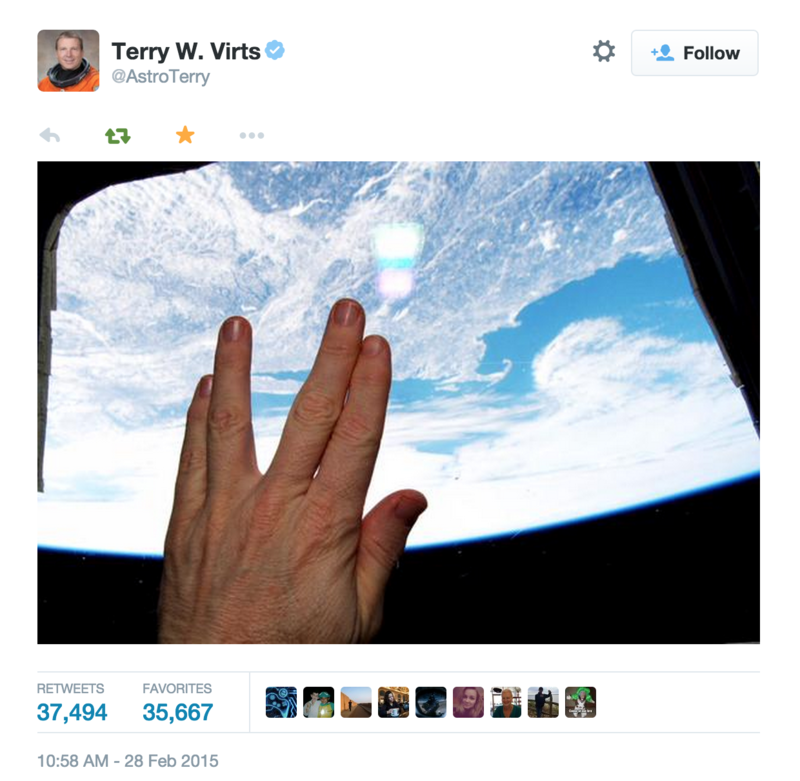 With tributes like this salute from astronaut Terry W. Virts, from the International Space Station, on Twitter, it seems almost ridiculous to add to chorus, but I think I do have something to add. I’ve long been planning a series of posts and essays around a theme of taking the messages we get from fiction way too far, and well, sometimes there is no time, like the present. Spock is among a small group of fictional characters that represented father figures and positive male role models in my life, in the absence of real life ones, while growing up. It feels good to get that off my chest. It feels a little cheesy, and cliche, to admit that fictional characters could have such an impact, but I can’t help it, it’s true. People who know me well might find it strange I’d include Spock in such a list of influences. I’m not someone that lets logic take complete sway in the choices I make in my life, but that’s the thing, neither did Spock. No, I’m not going to comment about his character’s internal struggle with his Human and his Vulcan side (although it is a compelling part of the character’s story), but with his external relationship with James T. Kirk and Leonard McCoy. The three formed a triumvirate that at times, in their open conflict with one another, had a discourse that enabled Gene Roddenberry to surface what he thought were important aspects to leadership, to curiosity, to passion, to ethics, governance, and morality. They were at times the Ego, Id, and Super-Ego, and at times the Body, the Mind, the Spirit. Not always the playing the same roles in relationship to one another, but always, empowered by their trust to speak their truths, and find shared meaning in their mission and friendship. 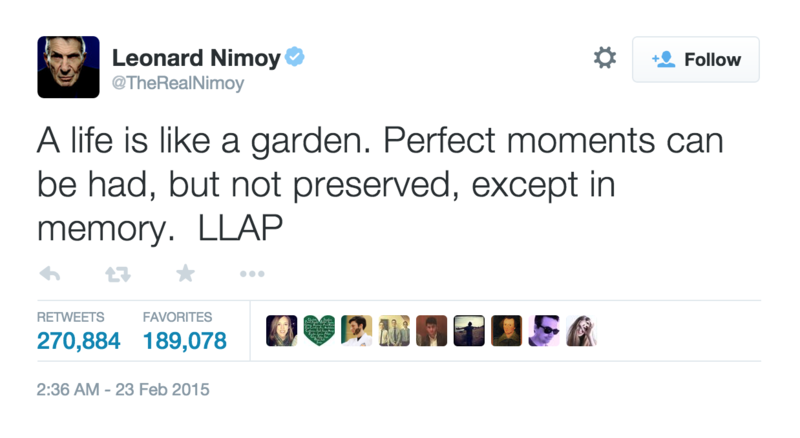 Paraphrasing Jen Ferrin, “Think like Spock, Feel like McCoy, Act like Kirk”. In a real way, it was their relationships to one another, that influenced the kinds of friends I seek and keep. They take courage on my part, similar to the kind Joe Campbell expresses in a recent post called “The Lies I Tell Myself”. You friends know who you are. I’m watching “The Undiscovered Country” today, while my family is out doing some shopping, as my own way to give a tribute to co-creation of Leonard Nimoy and Gene Roddenberry. It features a story written during the fall of the Soviet Union, about the potential fall of the Klingon Empire, and the peacemaking that’s needed, before a desperate war would probably commence between it and The Federation. Spock helps coordinate a dialog. There are actors on both sides, including Captain Kirk, that do not know how to foresee a future without the military balance of terror. Shenanigans happen, including the assassination of the Klingon protagonist of the peace process. It’s an underrated movie. I wish I could share a link so that you could view the documentary, the “Perils of Peacemaking” included on the bluray. There’s mention of the fall of the Soviet Union and the compassionate, proactive role we needed to play, in order to make sure that what remained of the Soviet Union would not devolve into a collection of failed states. Looking at Russia today, it seems we have failed, we have let the youth of the world down, and that’s frightening. Check out what happened at Philly.com. I’ve seen him perform in Suburban Station, at Rittenhouse Square (fun fact: he was threatened to be arrested for not having a permit), and out front of Reading Terminal Market. I’m very happy to see him get his chance after a few American Idol auditions that didn’t progress (your loss American Idol). In Philly? Get the details here! Hope to see you there.